First let me say that there are better ways to get to the capital of Bolivia than to hitch a ride on an overloaded 18-wheeler. The nights at 16,000 feet are bitter, the air is thin and the road (when possible to make out) is marked with crucifixes. Yet, I also realize that there are some things you have to find out for yourself. No amount of well intentioned advice is going to convince you otherwise. 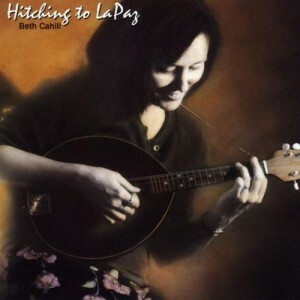 Hitching to La Paz is a collection of 11 original songs. It is also a metaphor for a journey where I had become lost, in every sense of the word. I was able to find my way again; after running out of gas, taking several wrong turns, and getting stuck in some pretty serious ruts. I also discovered in the course of finding my way, that to get anywhere worth going, a certain amount of “wandering in the desert” is necessary. I tried on the record, along with a group of really great musicians, to explore a variety of themes and characters encountered on this journey. There are moments that can feel dark. But, I tried to balance the darkness with humour, determination and even joy. One of the great things about playing the mandolin, aside from the music it can make, is that it is small and light. You can take it everywhere strapped to a backpackin the most remote places, where I had no hope of understanding more than a simple greeting, I have been able to play music for people. I have been able to occupy countless hours during unexpected delays and detours. I have been able to console myself when other forms of consolation were unavailable. I also experienced the power of music to bridge distances between different worlds. People who were initially suspicious and hard, softened before my eyes. In short, for all the travelers out there, both literal and metaphorical, I highly recommend this instrument.